The list of Liberal National Party Federal Government atrocities is long and growing daily. It is fertilised by the combined manures of neoliberalism, nationalism, ignorance, incompetence and utter disregard for the fate of those who differ in any way from the prescribed white, heterosexual paradigm of Western civilisation. This list is incomplete. It won’t be completed until this Government is voted out. It’s likely that in their fury at losing power, they’ll attempt to destroy as much as they can on their way down. Because that is who they are. By now, it ought to be obvious to just about everybody that the LNP is incapable of governing. What they sought from their election to government was the exercise of raw power, rather than the opportunity to successfully guide a country through the immense challenges we face. The focus of this Government is on retaining the privileges of political power, not the pursuit of democracy. Democratic principles are an anathema to the pursuit and exercise of raw power. The Coalition seeks to establish an illiberal democracy — one that functions with the outward apparatus of democracy and none of its substance. They are the Party of petty-mindedness, self-obsession, cruelty, dishonesty and insatiable greed. The Coalition sought to use its time in Government to promote an ideology, conflating existential culture wars with practical governance, because practical governance is beyond it. Policy is almost entirely replaced by politics. The Government knows well the strategy of creating a climate of fear then offering protection from the resulting exaggerated, or unwarranted, sense of threat. Home Affairs Minister Peter Dutton has made several blatant attempts to incite this fear and hatred in Melbourne, for example, with claims of "African gangs" running amok in that city. Nationalism is the preferred LNP tool for the preservation of conservative Western values: if you love your country you won’t allow it to be contaminated by people who don’t share those values. Nationalism and morality merge in this ideology — those who do not share the prescribed values are presented as morally depraved. Muslims are currently singled out for this demonisation, along with most people of colour. This demonisation has exacerbated insecurities and mistrust, threatening the cohesion of our communities. The Government steers citizen discontent in the direction of the foreigner in an attempt to deflect from its own failures and inadequacies. A single national identity is the goal — and that identity must reflect conservative values. The Morrison Government’s ambitions are not to work towards an equal and inclusive society, but rather to eliminate from consideration those it considers “un-Australian", a term whose meaning is exceptionally fluid, but can, in general, be taken to refer to those deemed “unlike us”. What policies or amendments to policies the Government have fashioned are, in the main, intended to flush the perceived toxins of difference from the body politic. This creates a vast array of others against whom traditionalists pit themselves in order to reinforce their own entitlement and validity. This last Sunday (13 January), Prime Minister Scott Morrison launched another attempt to reignite culture wars, surrounding the celebration of Australia Day on January 26. This is a date contested by many Indigenous citizens and others as unsuitable for celebration, marking, as it does, what many regard as an invasion. Morrison’s threat includes “forcing” local councils to hold citizenship ceremonies on that day — an effort to wrest back control over those who do not wish to recognise it as a day worthy of celebration. In doing this, Morrison is sending a clear signal to nationalists that they have the Government’s approval to fight for their imagined right to the day in complete disregard of those who legitimately object. This act of Morrison’s will inevitably provoke discord and is entirely unnecessary. It is also deeply offensive and hurtful to Indigenous people, who see January 26 as a day of mourning. The poor are also judged to be morally lacking by this Government and in need of punishment, a conservative attitude not peculiar to but reinforced by Morrison’s Pentecostal religion. Morrison’s faith is a “prosperity theology”, in which adherents believe God favours with material advantages those who follow him. The poor are thought to be responsible for their own poverty because of their failure to satisfy the Christian God’s need for worship. When the belief is that poverty is an individual moral failing, it becomes not the outcome of an unjust society that must be addressed by governments, but a personal matter for which governments and society bear no responsibility. Ideology is the prism through which the Government views the citizenry it so spectacularly fails to govern. Democracy is the ship of state that has long since sailed. And while the LNP retain many of our institutions and statutory bodies, they have either defanged them to the degree that they are increasingly ineffectual, or transformed them into weapons to be employed against citizens who displease them. 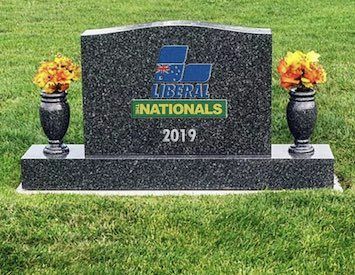 It may seem premature to consider the Coalition Government’s obituary. However, in the event of them retaining government at the next election, the above assessment of their collective character continues to apply. They have entirely failed Australia — both the country and its people. They will continue to fail both because their interest is not in democratic governance, but in power and the privileges it brings them.